White House: Clinton Spy Charges "Ridiculous"
President Barack Obama's spokesman is labeling as "ridiculous" an assertion by the founder of WikiLeaks that Secretary of State Hillary Rodham Clinton should resign if she was involved in asking U.S. diplomats to gather intelligence at the United Nations. In an online interview with Time magazine from an undisclosed location, founder Julian Assange on Tuesday called on Clinton to resign "if it can be shown that she was responsible for ordering U.S. diplomatic figures to engage in espionage in the United Nations" in violation of international agreements. White House press secretary Robert Gibbs said Wednesday that Assange's statements "are both ridiculous and absurd." 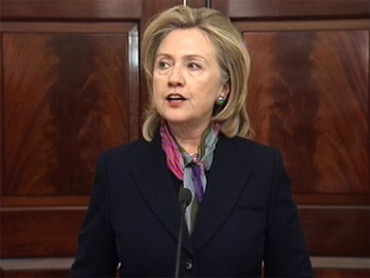 Clinton, he said, has done nothing wrong, and U.S. diplomats do not engage in spying. He spoke in an interview on NBC's "Today" show. State Department officials said Tuesday that secret instructions to American diplomats to gather sensitive personal information about foreign leaders originated from the U.S. intelligence community but did not require diplomats to spy. Requests for DNA and biometric data on foreign officials were contained in leaked classified cables published by WikiLeaks. "Secretary Clinton is doing a great job," Gibbs said. "The president has great confidence in and admires the work that Secretary Clinton has done." Meanwhile, Clinton said during a security summit that the trove of leaked diplomatic cables will have no adverse effect on America's international relations.